Kingston YMCA boys become the deserving recepients of Katy Sunrise Rotary Club donation to the Education Fund. The Kingston YMCA becomes the deserving recipient of a Katy Sunrise Rotary Club donation to the Education Fund through a joint project with the Inner Wheel Club of Kingston. The Kingston YMCA accommodates young boys from very unfortunate circumstances. Many of these boys are homeless and sleep wherever they can. Many have been subjected to much abuse in their short lives. All have dropped out of the normal school system and see no future for themselves. Mrs Sarah Newland-Martin, the Director of the YMCA, does a wonderful job in educating the boys to the extent that they can re-enter the normal school system and, so far, her success rate has been 100%. The YMCA has no Government Funding, and is totally reliant on donations. With the donation received from the Rotary Club of Katy Sunrise, the Inner Wheel Club was able to give $50,000 for the purchase of text books, and paid the education fees of one of the students. 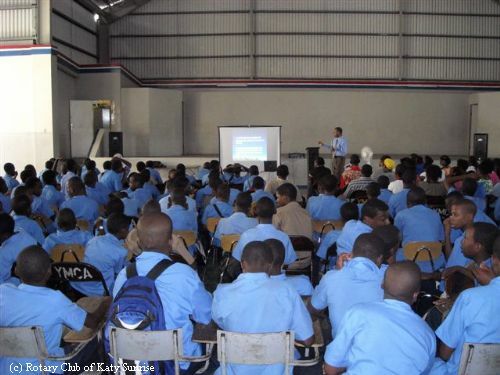 Other educational establishments that have benefited from the Inner Wheel Club of Kingston include the Mona Rehabilitation Centre, the two National Children's Home for girls and boys respectively, and many other basic schools. Through teaming up with organizations such as the Inner Wheel Club of Kingston, Katy Sunrise Rotary Club and Rotarians around the world are able to help change lives for the better in so many countries.